The response to part 1 was very positive so as promised, here’s part 2 of ordering food in real Japanese. I imagine the first thing most people come up with when thinking about Japanese food is “sushi” but for me, I would definitely say it’s “ramen”. Ramen was definitely a big part of what got me interested in the Japanese culture very early on. Tampopo is still one of my favorite movies of all time. If you haven’t watched it yet, you’re seriously missing out. Ahh, the rich and complicated world of ramen. There’s so many things to cover but let’s just start with the basics. First of all, ramen is everywhere in Japan so finding it is like trying to find a Starbucks, not very difficult. 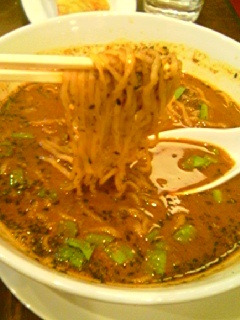 However, Ikebukuro is perhaps one of the neighborhoods more famous for it’s ramen. There’s one I particularly liked whose name I can’t recall where you can crush your own fresh garlic (I love garlic). Before we get into all the crazy ingredients that can go into ramen, you should first become familiar with the major types of ramen. These types will be generally enough to get your ramen fix in most generic ramen shops. Of course, many restaurants try to come up with clever names but it’s usually just marketing for these basic types of ramen. 醤油ラーメン (しょうゆラーメン) – The most common and generic type of ramen. Nothing much to comment on here except that it doesn’t really taste like soy-sauce at all. Sometimes 「醤油」 is written as 「正油」. 味噌ラーメン (みそラーメン) – As the name “miso ramen” implies, the soup’s flavor is based mainly off of miso. If you like miso, you’ll probably like miso-ramen. 坦々麺 (タンタンメン） – A spicy soup with the taste of sesame seeds either black or white. 豚骨ラーメン（とんこつラーメン） – Literally meaning “pork bone ramen”, the soup is flavored by boiling pork bones in water. This gives the soup a whiteish color. Personally my favorite type of ramen. チャーシューメン – Most ramen come with a slice of pork flavored differently depending on the ramen called 「チャーシュー」. This ramen is for lovers of 「チャーシュー」 as it has several heaped on. ねぎラーメン – For those who like 「ねぎ」 or green onion, this ramen is for you. It’s heaped with the stuff. つけめん – In this variation, the noodles are dipped in the soup as you eat. I don’t really like it that much because it tends to get cold very quickly but I do enjoy a spicy one occasionally. 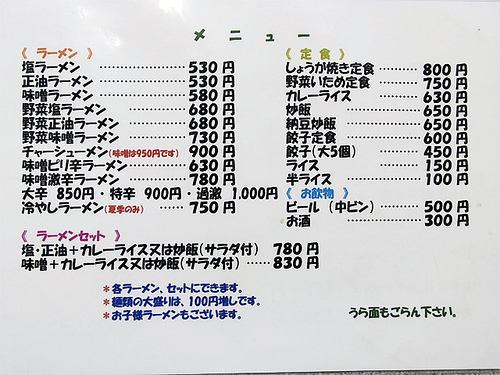 This is the main list but there are other types of ramen out there like 「カレーラーメン」, for example. In addition to the major types of ramen, sometimes the cook will ask you how hard you want your noodles. Personally, I prefer al dente as do many of the more hard-core ramen enthusiasts. You can even ask for soft but who likes soggy noodles? Another great trick for a really filling meal, if the option is available, is to save the soup and order an extra ball of noodles. This is called 「替え玉」（かえだま）. It’s like an extra bowl of ramen often for as little as several hundred yen! In Japanese, this is called 「具」（ぐ）, which basically describes the solid stuff in any kind of soup or stew. There are a lot of ingredients so I’m only going to go over the major ones except for those we already look at in the major ramen types. Also check out this the wikipedia ramen entry. There’s a lot more information about ramen as well, such as regional specialties. It’s all in Japanese but there’s also plenty of yummy pictures to feast your eyes on. Lovers of garlic and thick とんこつ soup like me will love 熊本ラーメン, though as I painfully learned first-hand, you probably don’t want to actually eat all the garlic chips. So there you have it. Welcome to the wonderful world of ramen! This post just barely scratching the surface so you haven’t seen nothing yet! This entry was posted in Culture, Intermediate, Vocabulary by taekk. Bookmark the permalink. How about http://www.flickr.com/search/?w=all&q=naruto+fish+cake&m=text for ナルト? I just tried a Google image search for “spiral fish cake” and I also got quite a few positive hits. I’m not much of a lamen man… I like soba too much, and udon second, so I rarely order lamen. At least around here (i.e. among Brazilian-Japanese immigrants), these basic flavours such as miso, tonkatsu, negi, oyako, tanuki, kitsune etc. are listed for all combinations with ramen, udon, and soba. There are some noodle-specific varieties though, such as cold zaru-soba. I also like 親子（おやこ, chicken + egg）because it has such a funny, un-vegetarian name (and it’s tasty, of course). What’s the Japanese for the different broth types? I absolutely hate the Japanese-style fish broth but I never know what I’m getting until it’s there. I’m sure they would understand 魚汁, but I’m also sure that it’s wrong. Tae – I love this series. I have been thinking about making something like this for a long time, but as I don’t have a blog, I never got around to it 🙂 Like you, convenience store and restaurant lingo caught me off guard for a long time even after I thought (incorrectly) my general language skills were pretty sharp. Wish I had a reference like this back then. On the ramen front, don’t forget about 太麺 (ふとめん/futomen) or thick noodles, and 細麺 (ほそめん/hosomen) or thick noodles. Some ramen joints actually let you choose.